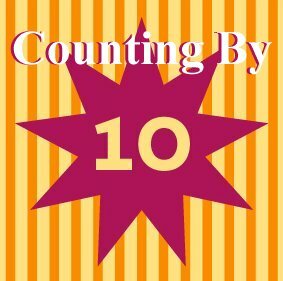 Skip counting by tens seems to come easier to a child than most of the previous numbers. 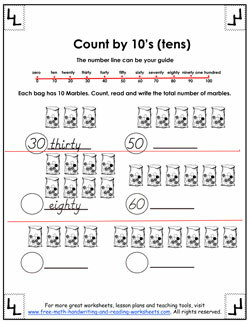 For this reason, many schools teach children how to count using multiples of ten before skip counting by any other number. The exercises below will be extremely helpful to the student when she moves forward to memorizing the various multiplication table sets up to ten. Before you start working on the activity sheets below, you may want to print out this multiplication chart which shows all the multiples of tens. Your child can use this along with the activities below to check her work or as a handy guide to help if she gets stuck. 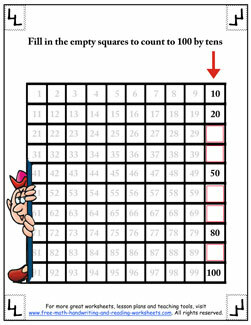 The first worksheet looks a lot like the multiplication grid above except there are numbers missing. 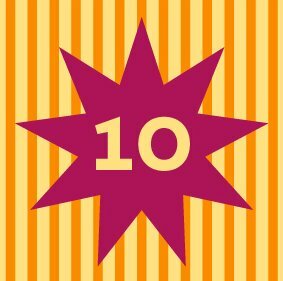 Count by tens to fill in the blanks. The second paper shows bags of marbles. Each bag has ten marbles inside it. You'll notice that there is some information given and some is missing. Use your counting skills to fill in the missing info. The final handout is a sequencing task. Multiples of ten are all jumbled up and out of order. 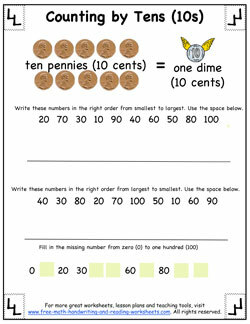 Have your child write the numbers in the proper sequence on the line provided.